There is still time to advertise your business at Platte Ridge Park Ball field complex! Keep track of your 2019 Platte County Programs and Events with these handy dandy Magnets! Call Sarah at Heartland Tree Alliance 816-561-1086 to Register. If interested in being a vendor for our Tails on the Trails event at Barry Platte Park please contact Jackie at 816-858-3419 or click on www.platteparks.com to sign up. This is a fun family event for dogs of all sizes and shapes! It will be a "paw"fect day in the park! FREE admission for Vendors and Patrons. Donations to participate in raffle and contests. Prizes & Giveaways! All proceeds will benefit Dogs by Debin and Friends of Parkville Animal Shelter. Wednesdays: March 27, April 24 and May 22. IF OUTSIDE: Strollers and dogs welcome! Kids, ages 5-12, will explore, learn, and connect each day! Other Platte County events.....Sign up now! Click here to register for Golf! To make a shelter or ball field reservation please call Jackie 816-858-3419 or email Jackie. You can check out the schedule on our website to see what is available. REGISTRATION OPENS APRIL 2ND on our website: www.platteparks.com. Join the Riverside Chamber of Commerce and Platte County Parks at the 4th Annual Tour de Platte on June 2nd. This is a freebicycle ride for bikers of all levels to cycle through the trails, parks and back roads of Platte County. The Tour will begin at 8:00 am at E.H. Young Park in Riverside, MO. Three route options are available (10, 18 & 34 miles). Afterward, the riders can enjoy a breakfast of baked goods and coffee. Hope to see you there! A FUN, FREE, FAMILY EXPERIENCE! On April 21st, all Metro Y locations will be hosting youth and family events from 10 am-1 pm! All Healthy Kids events are free and open to the public. Get kids moving and learning with a variety of fun, family activities and community resources! Saturdays and Sundays only - celebrate your next birthday with 4 different package options at the YMCA. Cookout Sides Made Easy - Wednesday, April 25th from 5:30-7:00 pm. BBQ season is around the corner, so come learn about cookout side dishes. $5 for Y members, $10 for non-members. Register by April 23rd. Reminder - Ladies' League starts Wednesday, April 11th! Did you know Shiloh Springs Golf Club has an amazing banquet room with spectacular views? For more information or to book event space, contact Jackie - 816-270-4653 or jhalloran@kempersports.com. April 14th, 5:00 pm. Kids Night out at the North & South Platte County Community Centers. ﻿April 20th, 6:30 pm. Tween Night. Platte County Community Center South. 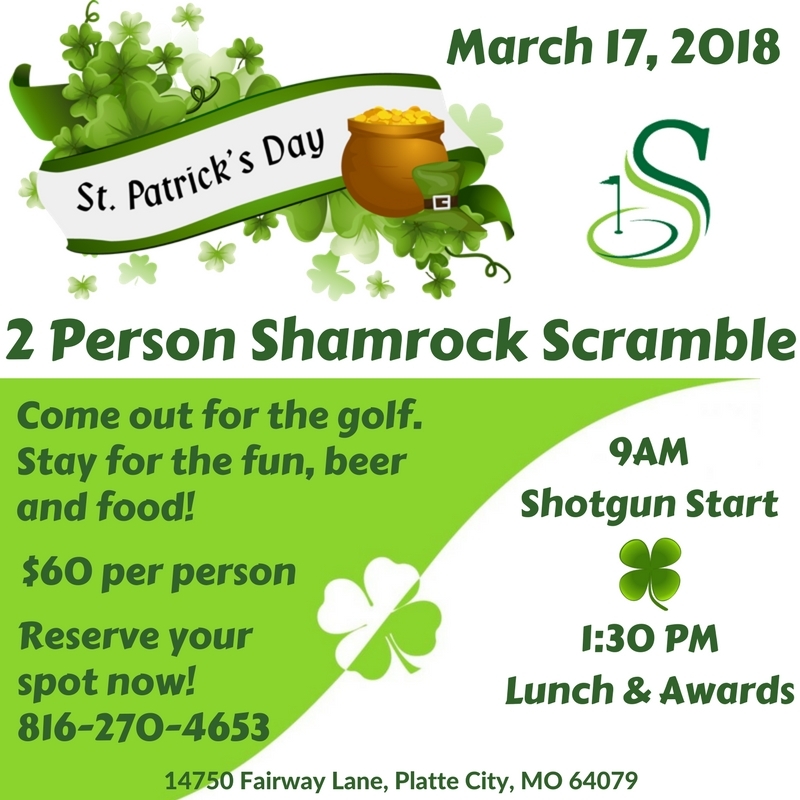 SHILOH SPRINGS ST PATRICK'S DAY TOURNAMENT! March 13th - Men's League starts. Sign up for returning teams-February 26th; new teams-February 28th. March 15th - Senior League (60+) starts. Sign up now. For more information or to book event space, contact Jackie - 816-270-4653 or jhalloran@kempersports.com. March 4th, 3:00 pm. Platte City Community Band Concert & Art Display. Platte County High School, Platte City, MO. March 10th, 5:00 pm. Kids Night out at the North & South Platte County Community Centers. March 16th, 6:30 pm. Tween Night. Platte County Community Center South. 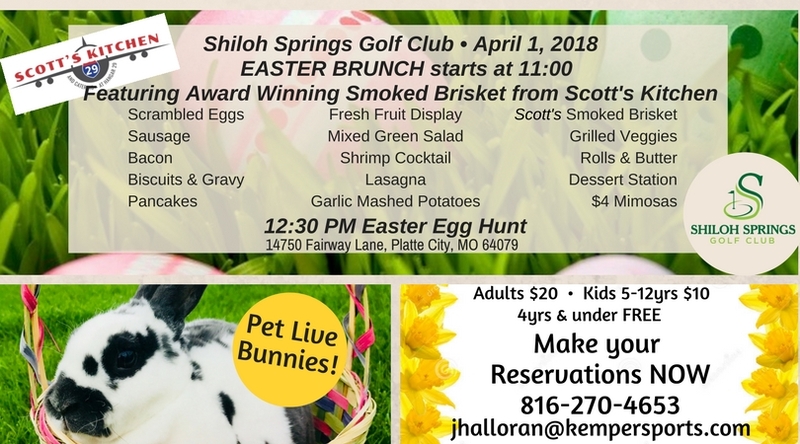 March Events at Shiloh Springs!